A two-colour version of the Olympic flag. The Olympic flag was visible everywhere. It was hoisted in the Stadium for the duration of the game, it was flown at each Olympic event, in the Olympic Village, and all over Sydney. And finally, during the Closing Ceremony the Seoul flag was passed on to the Mayor of Athens, where the Games of the XXVIII Olympiad will be held in 2004. As part of Liverpool City Council's effort to celebrate the Games in Liverpool, a number of Olympic Banners have been purchased to decorate selected streets of the Liverpool CBD. Liverpool Council is giving local businesses the opportunity to participate in the Olympic Banner Program by becoming an Olympic Banner Sponsor. The design of the flags was inspired by the vitality of the Australian environment and its people, elegant swirling shapes and concentric forms suggest the vibrant waters of Sydney Harbour. Australian landscape forms and the energy of fire is also apparent in the design. The design suggests flickering flames and the "heat haze" effect often experienced in rural and urban areas of Australia. They are symbolic of the passion demanded for Olympic competition and streamlines, fluid movement of the athletic body in action. I think quite a few flagpoles were erected around Sydney specifically for these banners. In suburban areas, they are now generally occupied by local council banners or Centenary of Federation banners of a similar nature. At each Opening Ceremony the first flag to enter the stadium in the Parade of Flags is the flag of Greece. And at each Closing Ceremony, when the Olympic flag is passed on to the next host of the Olympic Games a Greek flag is hoisted to symbolize their past. But at Sydney 2000 something unique did happen: The flag hoisted to symbolize the future of the Olympic Games was likewise a Greek flag, since Athens will be the next host of the Olympic Games. As Australia was the host country of Sydney 2000, the Australian national flag could been seen at every Olympic event. At the Opening Ceremony during the Parade of Flags, the flag of the host country was the last to enter the stadium. And at the Closing Ceremony the Australian flag was hoisted to symbolize the host country that was passing on the Olympic flag to the next host of the Olympic Games, Athens. Australia does have more than one national flag. In recognition of this the Sydney 2000 organizing committee has flown the Aboriginal flag and the Torres Straight Islanders flag alongside the Australian flag over the Sydney Olympic Park, the Olympic Village, the Sydney Opera House Olympic precinct, and three other prominent locations. In ancient times an Olympic Truce was pledged for the duration of the Olympic Games. Since 1993 the UN have restored this tradition, and every two years, before the Winter or Summer Games are held, the General Assembly of the United Nations calls on all states and all international and national organizations to observe an Olympic Truce, starting one week before the Olympic Games are opened, and lasting until one week after the Olympic Games are closed. To signify the Olympic Truce, and to recognize that both the United Nations and the Olympic Movement strive for peace and understanding among all nations and people, at the Olympic Games the UN flag is flown at each Olympic event. Trying to find out something about the flags manual at the 2000 Sydney Olympics I realized that such a manual is available for consulting only in some Australian libraries, not for sale so far. If any one is able to take a look on them a get the book scanned the FOTW community would be really thankful. At http://www.ebay.com/itm/301198078830 a flag of Olympic applicant city Sydney 2000. I've seen this logo depicted on flag pins: Crossed flags showing a sponsor of Sydney's bid on one flag and the applicant city flag as the other. This, however, is the first time I see an actual flag. 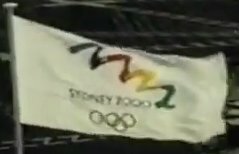 Ad description: "This original Sydney 2000 Olympic Flag is a rare collectable item in brand new condition, never used. The size is 1700/800mm screenprinted on 600D woven bunting material - Defence Force Grade." The dimensions of 17x8dm would mean the flag is longer than 1:2. * <oly@s27sya.jpg> - Sydney applicant city, cropped and shrunk. version is available in the ad or from me. 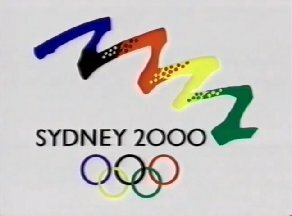 The flag is the logo on a white field: "SYDNEY 2000" in black below and left of a brush stroke resembling four arches of the Sydney Opera House in blue (top left of logo), black, red, yellow and green (bottom right), with white (on black) and black (on red) dots softening the transition between black and red, and similarly yellow and red dots on the red/yellow, and green/yellow dots on the yellow/green. The shape, as mentioned, is the Opera House, the colours those of the Olympic flag, and the dots presumably intended to resemble an indigenous art style. 1) Paper handwavers in this design (with logo printed in the same orientation on both sides) were ubiquitous at bid events. 2) At 4:17 in a video from the time now on Youtube, you see a flag on the Harbour Bridge with same logo and also the Olympic rings underneath. Sydney 2000 candidate, from Sydney Harbour Bridge. I think at the time applicant cities were already barred from using the Olympic rings, which would suggest that this is the Candidate City flag. The design is visible slightly earlier in the video as well. No doubt that same skilled GIFfer would be able to use it to draw a candidate flag from. Slightly before that, http://youtu.be/pKUzhu8kQDE?t=3m44s, the match of the logo with the silhouette of the Opera House is shown briefly. 4 Jonathan Dixon, 30 August 2001.